Container ship « What Happened to the Portcullis? French shipping giant CMA CGM will start phasing in ‘smart’ containers this year, allowing the line and its customers to keep track of each box equipped with new sensors at all times. 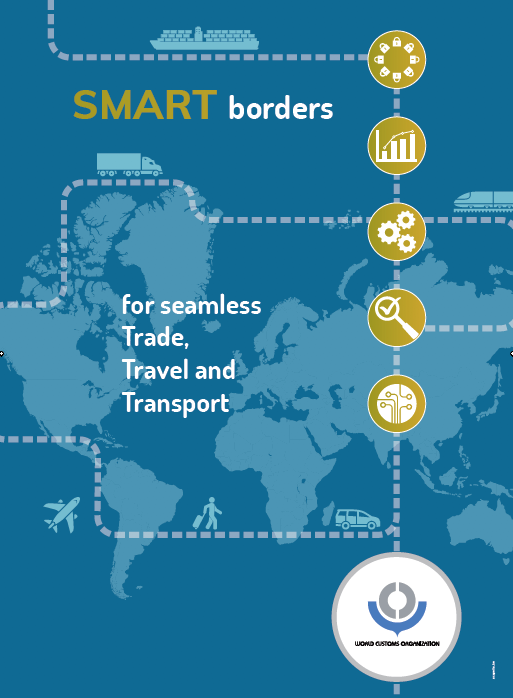 In an industry first, technology being developed with a start-up company, Traxens, would enable data on the location and condition of the container to be monitored at all times throughout a delivery. The world’s third-largest container line and Ocean Three member said it had contributed to the capital increase of French firm Traxens that will enable CMA CGM to have access to an unprecedented amount of information on each container and offer clients what it describes as unique tracking solutions and real-time data collecting from all over the world. Elie Zeenny, CMA CGM senior vice-president, Group IT Systems, said the technology would bring the shipping industry into a new era. This year, Traxens plans to equip the first CMA CGM containers with the patented technology so it will be possible to know in real-time not only a container’s position, but also its temperature, the vibrations it will be subjected to, any attempted burglary, the presence of traces of specific substances in the air or even the regulatory status of the cargo. Hyundai Heavy Industries Co. in Ulsan, South Korea has just named the new title-holder for the world’s largest container ship; a 19,000 TEU giant for China Shipping Container Lines (CSCL) named CSCL Globe. CSCL Globe measures 400.0 m in length, 58.6 m in width and 30.5 m in-depth, and will be deployed on the Asia-Europe trade loop after being handed over to the owner later this month. The ship was ordered by CSCL back in May 2013 along with four other 19,000 TEU capacity ships for a total cost of $700 million. The series was originally planned to carry 18,400 TEUs, but were later updated by 600 TEU. 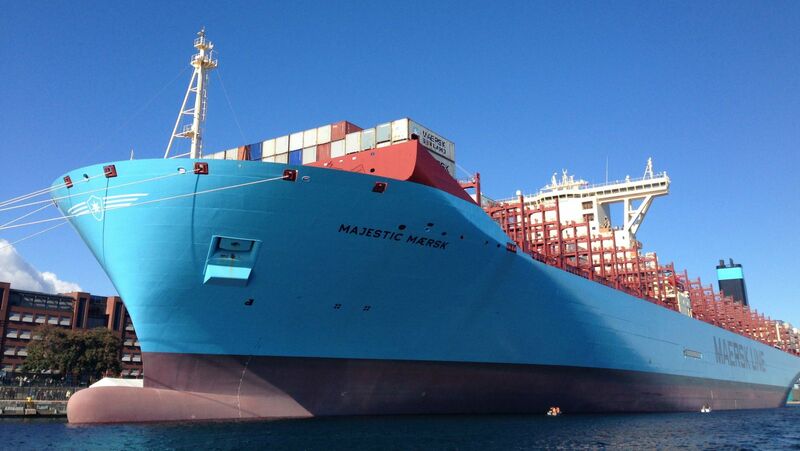 For comparison, Maersk’s Triple-E’s have a TEU capacity of 18,000 and measure 400 meters long by 59 meters wide. Maersk Line has ordered a total of 20 of the ships from Daewoo Shipbuilding and Marine Engineering, also in South Korea, to be delivered by 2016. 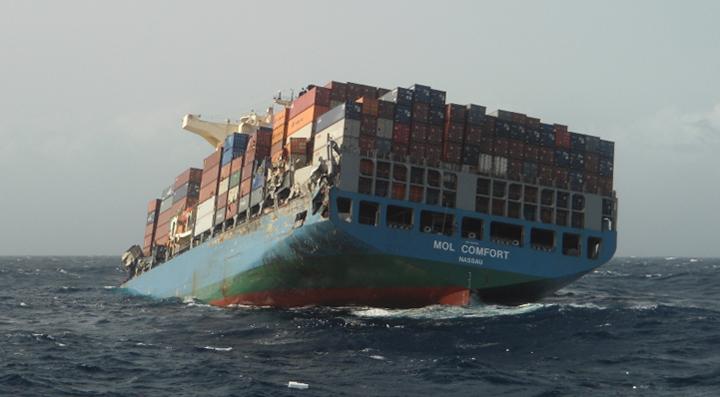 Many may recall the shocking pictures of MOL Comfort’s last voyage last year – images of a huge crack in the fully laden container ship on the high sea. While conducting research for her PhD thesis at the Technical University of Denmark, Ingrid Marie Vincent Andersen, PhD had found clues prior to this incident suggesting the possibility of catastrophic failure was more real than previously thought. Digging deep into the hydro-elastic structural response of container ships similar to the MOL Comfort, she had discovered some very interesting details. Clearly, the ship had broken up when the hull girders failed, but what led to that failure was not so obvious. She, like many others, say it very likely had a lot to do with the cargo loading condition of the ship, but the full answer was quite a bit more complicated than that. Anderson says the MOL Comfort and her sister vessels were simply under engineered by naval architects that didn’t fully account for enormous additional loads which were being placed on the ship. “It is believed that the hydro-elastic effects and the effect of hull girder flexibility are capable of significantly amplifying the hull girder stresses and thus contribute to fatigue damage as well as to the extreme hull girder loading in container ships,” Andersen notes in her PhD thesis. In her research, she studied ships in the 8000-9000 TEU range and discovered, “the hull girder vibrations due to hydro-elastic effects is capable of doubling the stress response amidships in some cases – also in the extreme loading cases.” Click here to witness a video of stress experienced on a container ship. “I don’t think the incident was fatigue-related, but it could be due to under-estimation of the hydro-elastic effects on the wave-induced vertical bending moment at the design stage. The major uncertainty at the design stage is related to estimation of the wave loads,” notes Anderson. Research published by Lloyd’s Register (LR) engineers Nigel White and Zhenhong Wang support Andersen’s research. LR notes the principle design challenge inherent to large and ultra-large container ships is the combined effects of whipping, springing and warping/distortion of the hatch openings. Until recently, Andersen notes that hydro-elastic effects have not been directly taken into account for in the classification societies’ design rules for container ships. In 2014, LR updated their design rules to reflect the discovery of much higher loadings inside the structure of container ships. Andersen, White and Wang all cite strain data captured aboard a 2006-built CMA CGM 9,600 TEU container ship over a four-year period showing severe spikes in the vertical bending moment as wave strikes on the bow resonate down the ship. Anderson notes that due to a large uncertainty around sea state conditions a vessel will encounter, maximum wave loading is subsequently uncertain. Wave loading is compounded by container ships that opt for greater cargo space forward, and thus greater bow flare such as on the MOL Comfort and the ultra-large 14,000 TEU+ sized vessels that are currently in operation. These bending moments, according to their research can be upwards of 300 percent the traditionally calculated wave bending moment using linear ship motion codes – the ones that ships have traditionally been built to. The traditional codes have a realized safety factor of around 200 percent. “The high strength steel used for the construction of the ship will result in a slightly lower natural frequency and possibly, together with the pronounced bow flare, making the vessel more susceptible to whipping vibrations,” adds Anderson. Since the MOL Comfort sinking, all of the sister vessels to the MOL Comfort have been retrofitted with additional structural steel, but certainly other ships in that size range have not. 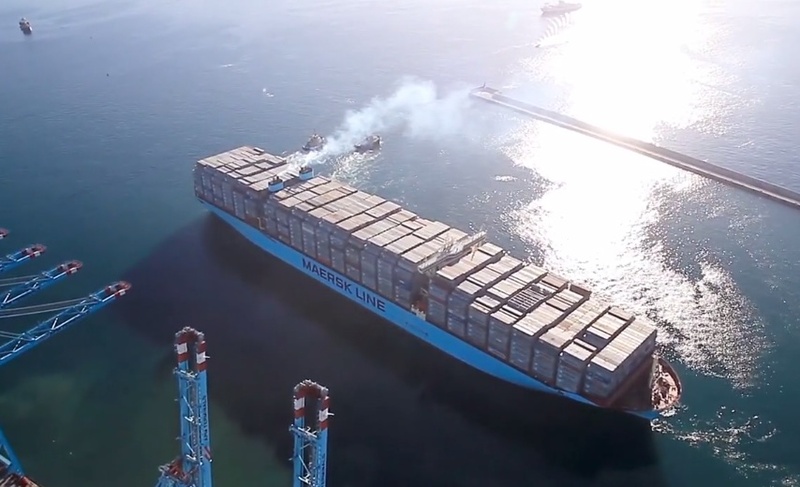 On July 21, 2014, the MV Mary Maersk departed Algeciras, Spain with a world record 17,603 twenty-foot equivalent units (TEU), the most TEU’s ever loaded onto a single vessel. MV Mary Mearsk is the third vessel in Maersk Line’s Triple-E class, which have nominal capacity of 18,270 TEU, although port restrictions have prevented the vessels from reaching full capacity. Maersk have suggested that almost 85 percent of the containers were empty, with the rest containing mostly dry goods and frozen meats. They also reinforced the fact that none of the containers were carrying harmful substances and that many had sunk in the turbulent seas. Nevertheless, French authorities have been on the lookout for floating containers, which can be hugely problematic for other shipping vessels, alongside a huge environmental risk. According to New Zealand marine insurer Vero Marine, a 20-foot container can float for up to two months, whilst a 40-foot container may float up to three times longer. Already, containers have been surfacing as far away as the coast of East Devon, United Kingdom. The 40-foot container washed up at Axmouth, near Seaton and is estimated to contain 14 tonnes of cigarettes. Police were immediately called in to cordon off the area and scare away any would-be smokers hoping to make a steal and sneak off with a portion of the 11 million cigarettes (refer to picture gallery). As of yet, there has never been a requirement for shipping lines to report container loses to the International Maritime Organisation (IMO)or any other international body. In 2011, the World Shipping Council estimated that around 675 containers were lost at sea, whilst the Through Transport Club, which insures 15 of the top 20 container lines, has suggested that the number is closer to 2,000. However, other sources suggest that this is nowhere near the true number, with some citing as many as 10,000 lost at sea each year. Analysts have suggested that one of the reasons such loses can occur are due to the lack of accuracy when weighing containers before transit. Some shippers have been found to understate the weight of containers in order to reduce shipping costs. Such misinformation can lead to uneven strain on a vessel as it transverses the seas. 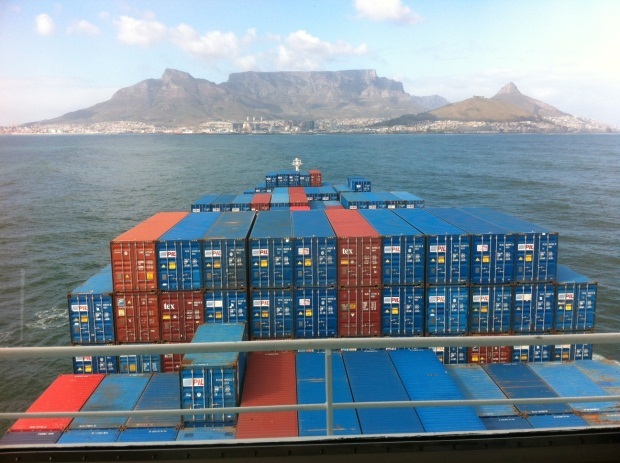 A Port Control ships Pilot was set to be airlifted by helicopter to the ship and the ship will be moved to the Container Docks in the Port of Table Bay where they will be met by Cape Town Fire and Rescue Services who will board the ship to fight the blaze. A (National Sea Rescue Institute) NSRI rescuer, Gavin Kode, was transferred onto the ship to make an evaluation and confirmed that no crew are injured and that they are The 222 meter fully laden container ship LILAC reported a fire in one of their holds, 1 nautical mile off the Port of Table Bay in South Africa on 28 September, with a total of 21 onboard. The ship’s captain reported that his crew was fighting to contain the fire, and that at this stage he was not declaring an emergency. A ship’s officer reported that they were fighting the blaze with Co2 fire equipment. The National Sea Rescue Institute (NSRI) deployed 4 rescue vessels, and remained close to the ship as a precautionary measure. On their arrival, light white smoke could be observed coming from the ship.